If this leaves you with a bit of déjà vu, you’re not alone – the 2015 GLA45’s styling and specifications virtually mirror the “concept” shown in Los Angeles. 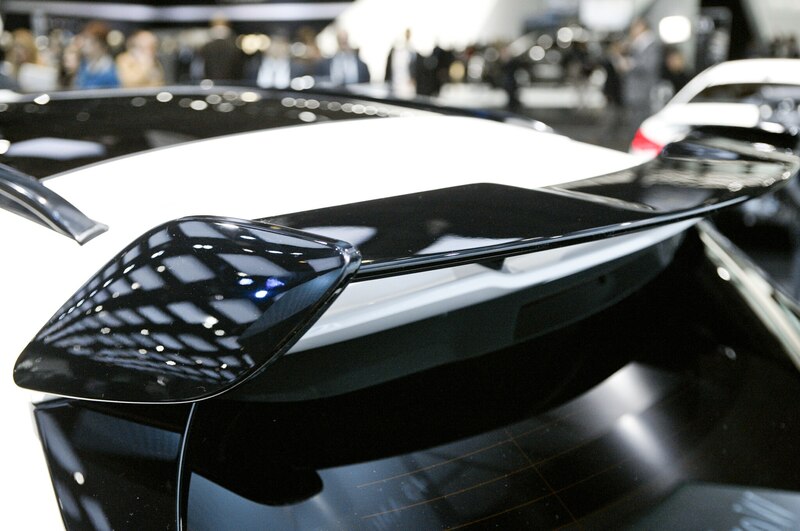 Tobias Moers, chairman of Mercedes’ AMG performance wing, says in a prepared statement that the reaction to the show car in California “reaffirmed our decision to launch this new AMG model,” but Mercedes had long ago committed to AMG-ifying its entry-level compact crossover, even well before the gussied-up show car popped up in California. 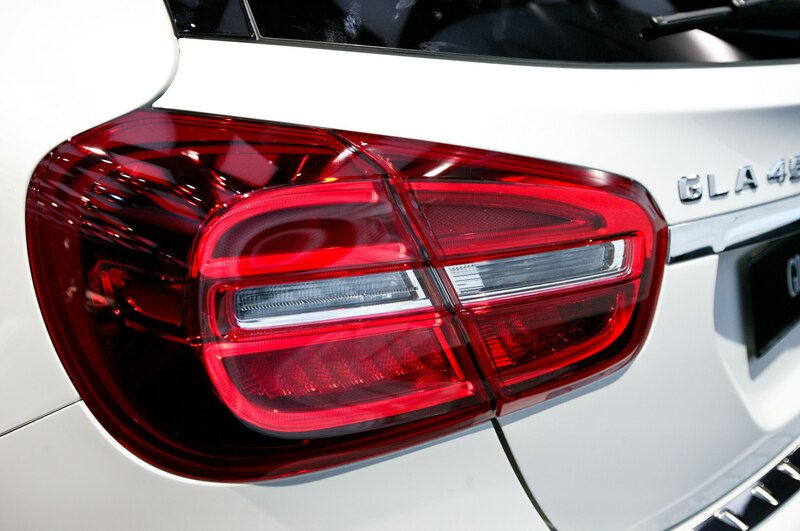 Not only does a performance-oriented GLA give Mercedes-Benz hardware to counter the likes of BMW’s six-cylinder X1 xDrive35i or the Infiniti QX50, but it also gives Mercedes yet another means to lure young, first-time buyers to its niche AMG performance brand. 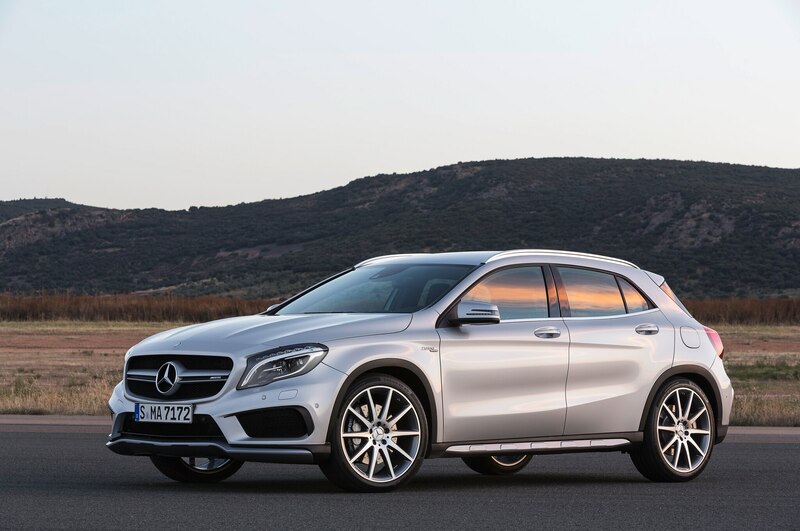 The 2015 GLA45 AMG may be considered the fourth AMG-tuned sport utility in Mercedes-Benz’s U.S. portfolio, but like the remainder of the GLA-Class range, it shares more with Mercedes-Benz’s new range of entry-level passenger cars than its SUVs. 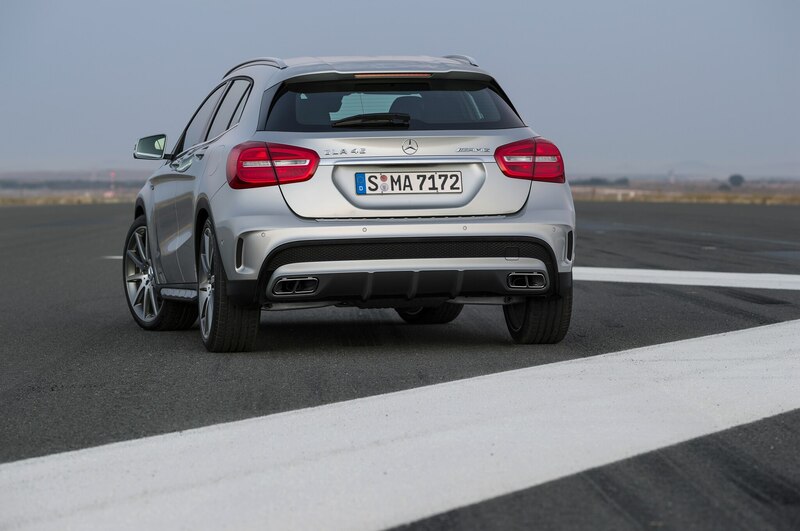 As the new 2015 Mercedes-Benz GLA-Class is little more than an A-Class hatchback with greater ride height, chunkier bumpers, and other visual tweaks designed to emulate an SUV, it should be no surprise to discover the AMG-tuned 2015 GLA45 AMG is practically identical to the AMG-tuned A45 AMG that’s already sold overseas. Likewise, its platform and mechanicals are also shared with the CLA45 AMG four-door coupe that rolled into U.S. showrooms late last year. 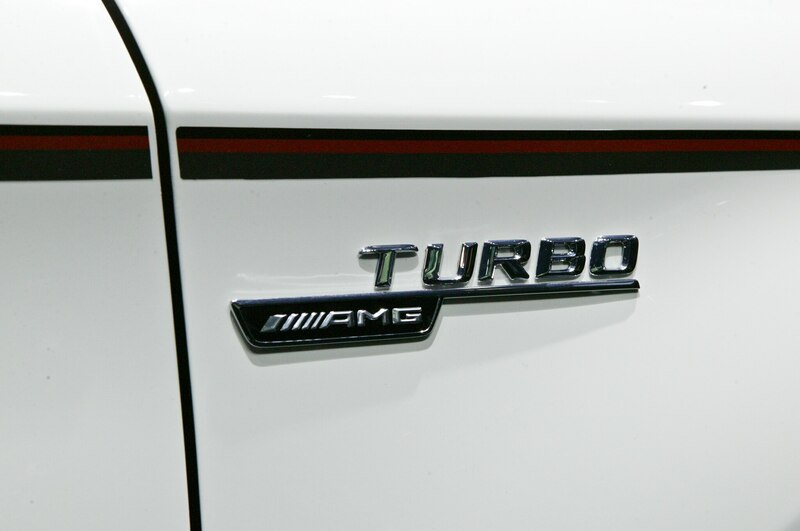 That means the 2015 GLA45 AMG is also powered by the M133, a turbocharged, 2.0-liter four-cylinder hand-built at AMG’s engine facility in Affalterbach, Germany. 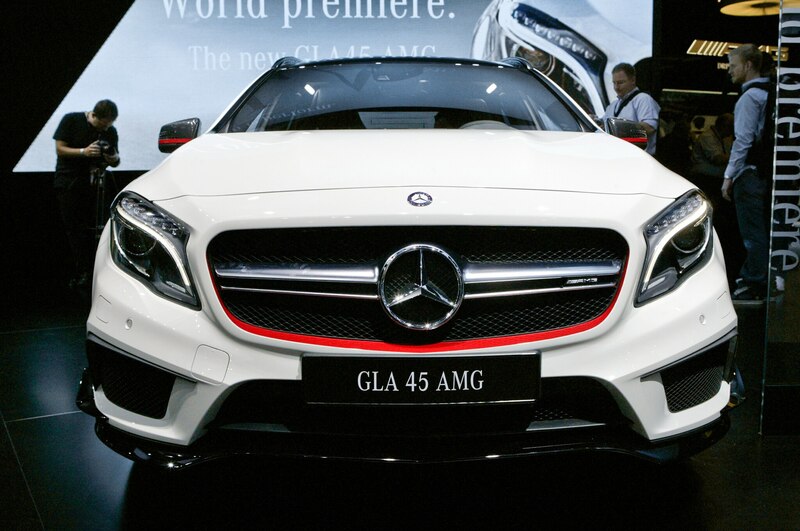 Early press materials promised the GLA45-spec engine would be as powerful as its A45 and CLA45 siblings, and that seems to be the case, as Mercedes now says the 2015 GLA45 is rated at 355 hp and 332 lb-ft of torque. That engine is again mated to a seven-speed dual-clutch automatic transmission, which in turn sends its power to all four wheels by way of a 4Matic all-wheel drive system, which can send up to half the engine’s output to the rear wheels. 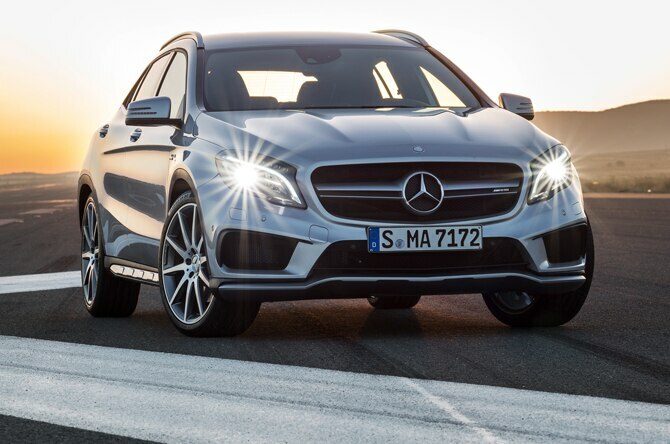 If Mercedes-Benz’s metrics hold water in the real world, that drivetrain is enough to rocket the 2015 GLA45 AMG from 0-60 mph in 4.8 seconds – only three-tenths of a second slower than the CLA45 AMG sedan – and up to an electronically-limited top end of 155 mph. 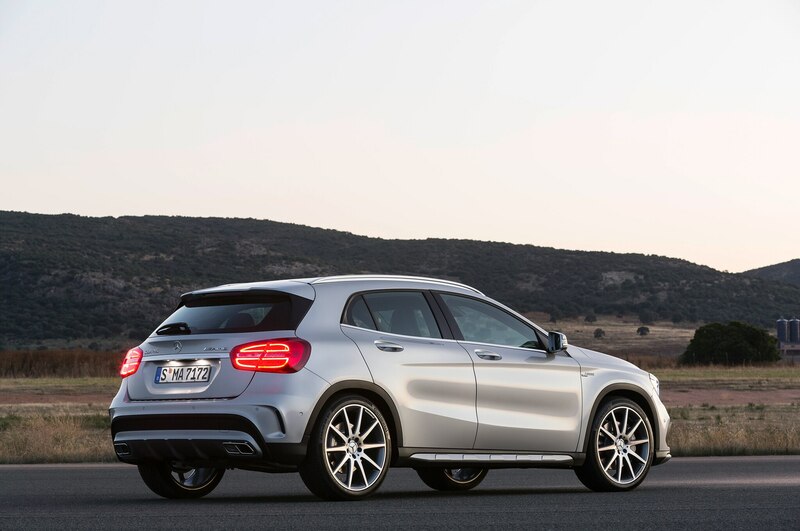 AMG’s transformation of the GLA-Class involves more than just powertrain. 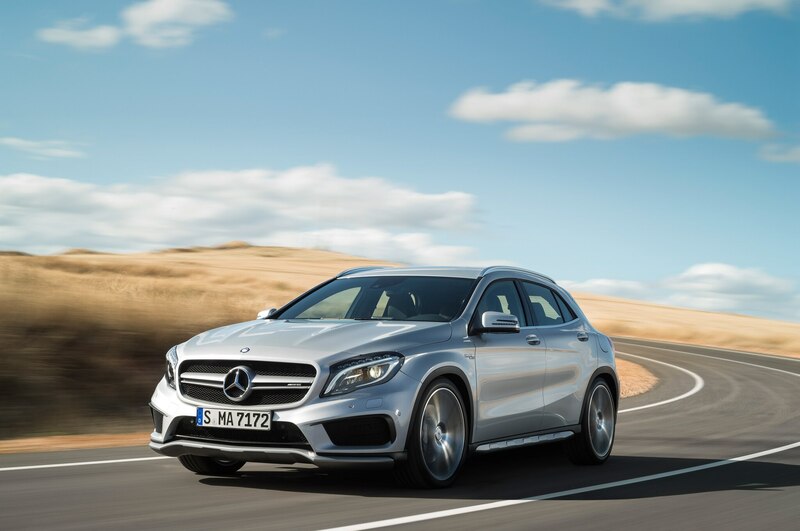 The 2015 GLA45 AMG also receives some upgraded chassis hardware, including beefier steering knuckles, stiffer springs and dampers, and larger anti-roll bars. Hard-core buyers seeking something sportier can opt for a package that promises even higher spring rates and stiffer dampers. 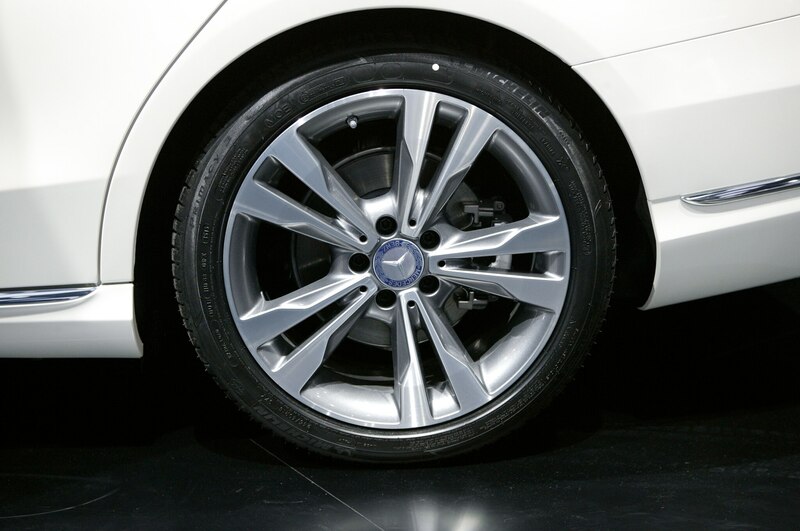 19-inch split five-spoke aluminum wheels are standard, though 10-spoke, 20-inch rims – finished in either titanium gray or matte black – are available at extra cost. 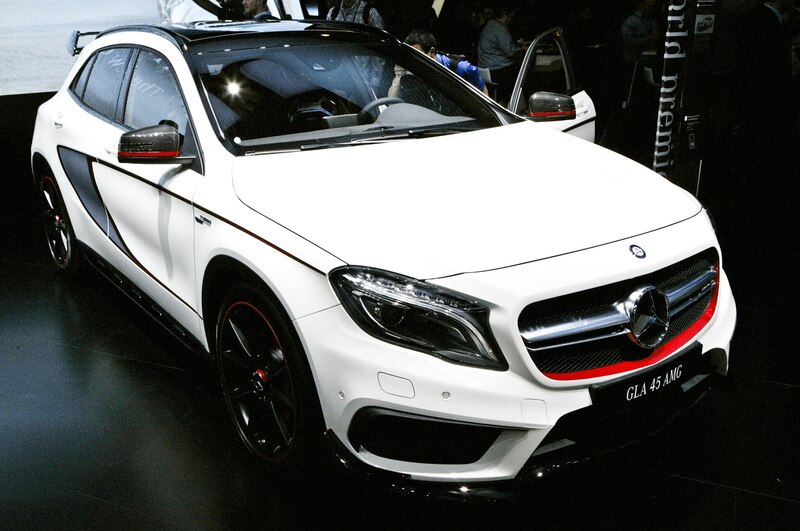 Cosmetically, the 2015 GLA45 AMG is the spitting image of the Los Angeles show car, which in turn was nearly a clone of the A45 AMG hatchback. 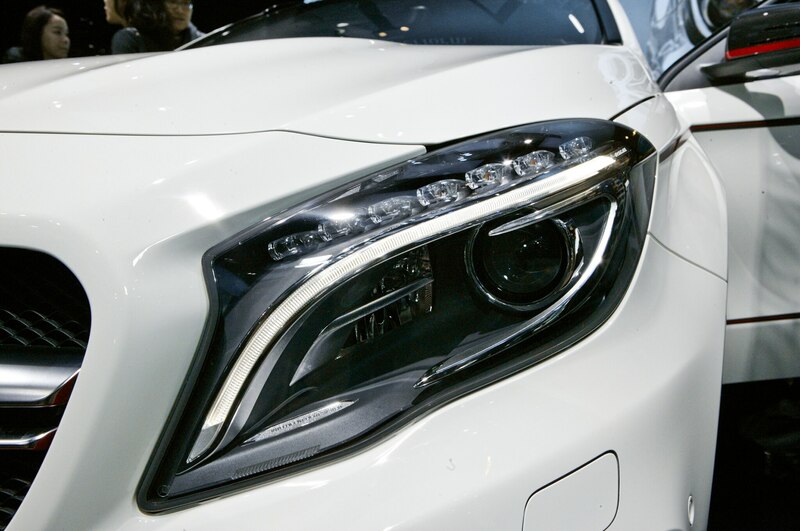 Although its double-domed hood is a unique GLA touch, the rest of the GLA45 AMG’s front fascia is cribbed from the A45 AMG. 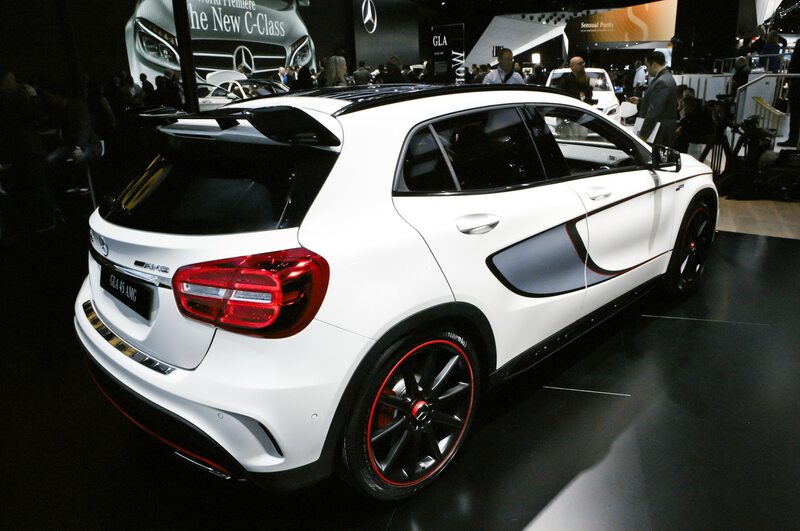 The production car does without the blacked-out C-pillars used on the show car, but the production-spec GLA45 is available with black anodized beltline trim, chrome grille louvers, and gloss black exterior trim, all part of an optional Night appearance package. 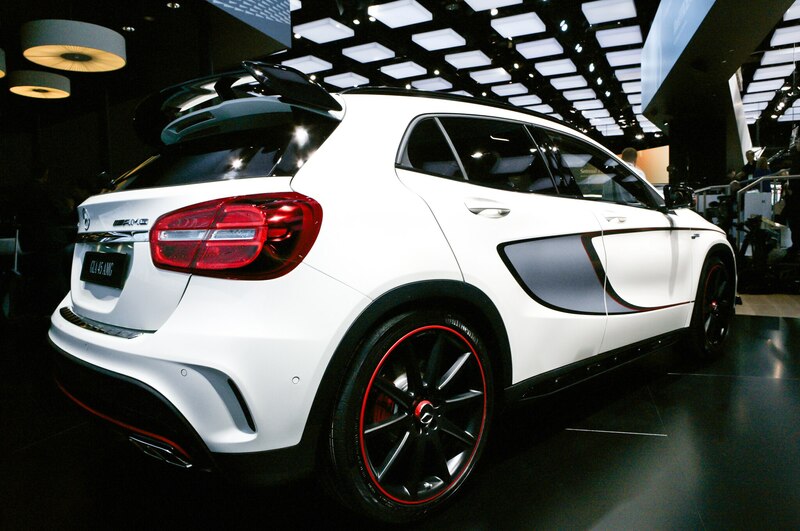 Customers demanding a boy-racer look will likely want to opt for the red-painted brake calipers and the rear spoiler, which emulates the wild wing used on the GLA45 concept. 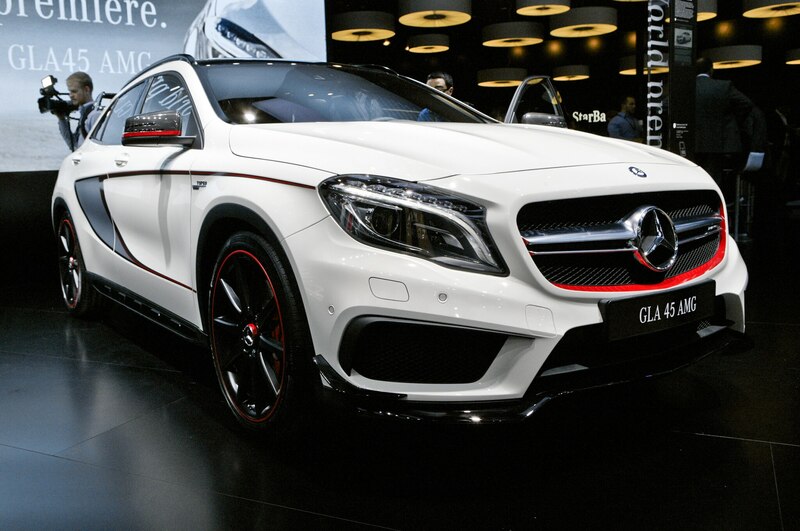 Want to make your GLA45 AMG look even more like the show car? 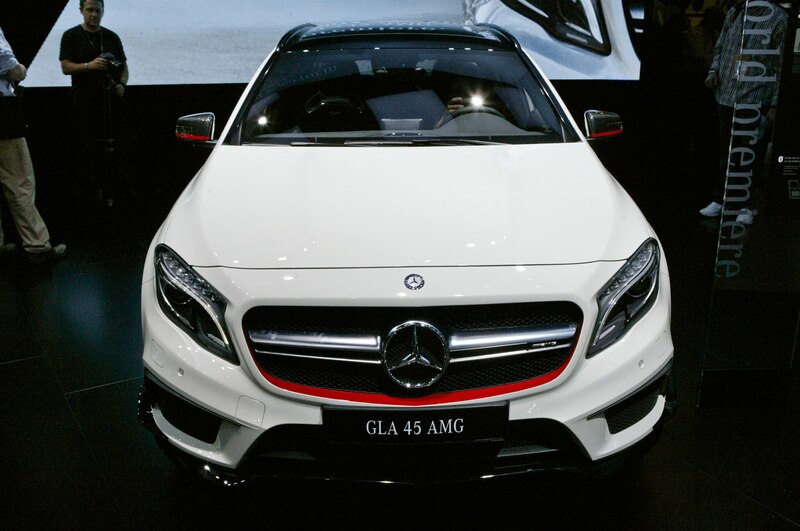 Opt for the Edition 1 package, which follows in the footsteps of similar packages offered on the CLA45 AMG and A45 AMG. 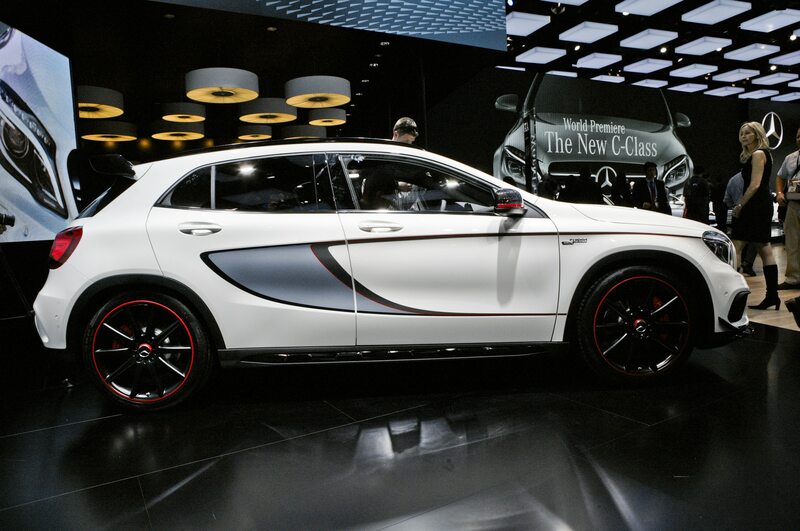 On the GLA, the package adds additional canard spoilers to the front fascia, the aforementioned rear wing, and bright red accents on the grille, mirror caps, diffuser insert, and rear spoiler. If that isn’t loud enough, the Edition 1 also boasts gray and red racing stripes on each side, red brake calipers, and matte black wheels with red rim edges.